Although ticks are commonly thought of as insects, they are actually arachnids like scorpions, spiders, and mites. All members of this group have four pairs of legs as adults and have no antennae unlike adult insects which have three pairs of legs and one pair of antennae. Ticks are among the most efficient carriers of disease because they attach firmly when sucking blood, feed slowly and may go unnoticed for a considerable amount of time while feeding. Ticks take several days to complete feeding. 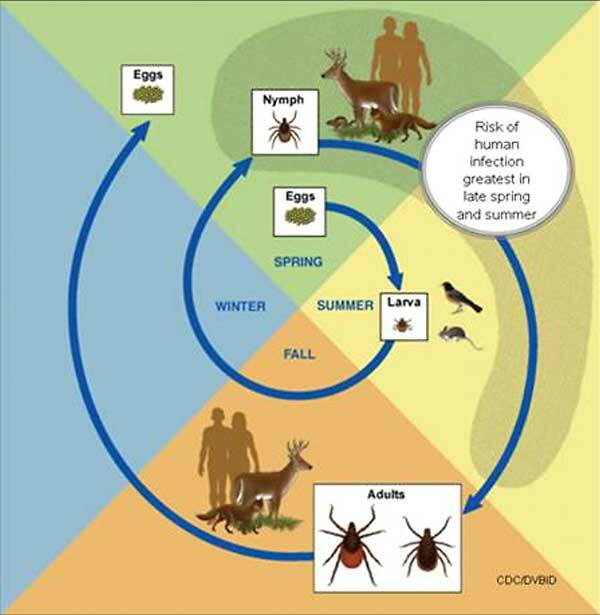 Ticks have four life stages: egg, six-legged larva, eight-legged nymph and adult. After the egg hatches, the tiny larva (sometimes called a "seed tick") feeds on an appropriate host. The larva then develops (molts) into the larger nymph. The nymph feeds on a host and then molts into an even larger adult. Both male and female adults find and feed on a host and then the females lay eggs sometime after feeding. Ticks wait for host animals from the tips of grasses and shrubs (not trees). When brushed by a moving animal or person, they quickly let go of the vegetation and climb onto the host. Ticks can only crawl; they cannot fly or jump. 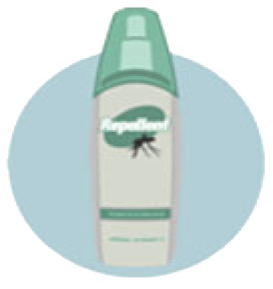 Ticks found on the scalp have usually crawled there from lower parts of the body. Some species of ticks will crawl several feet toward a host. Though ticks can be active all year-round, the risk of human infection is highest in the late spring and summer months. While at least 15 species of ticks occur in Illinois, only a few of these ticks are likely to be encountered by people: American dog tick, lone star tick, blacklegged (deer) tick and brown dog tick. Transmits: Ehrlichia chaffeensis and Ehrlichia ewingii (which cause human ehrlichiosis), Heartland virus, tularemia and STARI. Comments: A very aggressive tick that bites humans. The adult female is distinguished by a white dot or "lone star" on her back. 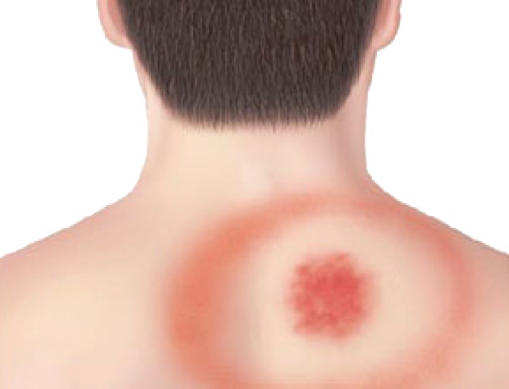 Lone star tick saliva can be irritating; redness and discomfort at a bite site does not necessarily indicate an infection. The nymph and adult females most frequently bite humans and transmit disease. Where found: Widely distributed across the eastern United States. Transmits: Borrelia burgdorferi and B. mayonii (which cause Lyme disease), Anaplasma phagocytophilum (anaplasmosis), B. miyamotoi disease (a form of relapsing fever), Ehrlichia muris eauclairensis (ehrlichiosis), Babesia microti (babesiosis), and Powassan virus (Powassan virus disease).